Would you like to get paid to exercise? I was taking an aerobics class last year when the instructor suggested that I get certified to teach. It didn’t take me long to conclude that getting paid to exercise would be a good thing for our bottom line (pun fully intended)! Staying fit is something most people seem to struggle to find time for, but if you’re already a regular exerciser and you can bring in a little income while you’re at it — that’s a good use of your time! And if you’re not a regular exerciser, getting paid to exercise may help keep things affordable and keep you consistent. Getting certified as a group exercise instructor will require an initial investment, but if you teach at a club or gym, you will most likely receive a free membership there. This may also include free or discounted family memberships and other classes or programs that may be offered. 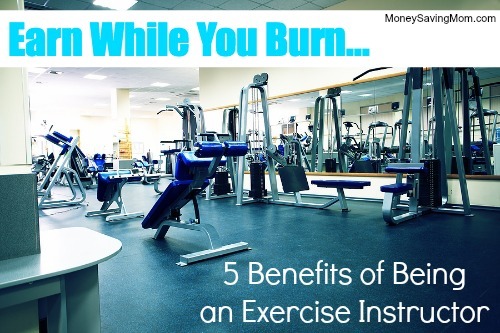 Right now, we’re saving about $600/year in gym membership fees. There is a broad selection of gyms and clubs that offer a variety of aerobics classes at various times from early morning to late evening. There is a good chance you can find a type of class you’d like to teach at a time that works for you. Of course when you’re just starting, you may have to be flexible, but there are a lot of options. Many gyms offer childcare which contributes to both flexibility and savings: you can take your children to work with you, and you don’t have to pay for baby sitting. I’ll admit, the income will probably be small, but even an extra $100/month could make a big difference for some people. Additionally, staying healthy and fit may pay dividends in the long-run in terms of health care costs. If you’re not already doing so, start take a variety of group exercise classes so that you can familiarize yourself with the format. Talk to the instructors to find out how they got certified; ask them about employment opportunities at the gym. There are several organizations that certify group exercise instructors, and all will require an initial investment: the fee for the certification workshop and study materials. However, there my be ways that you can cut down on those initial costs. A little online research will help you learn about the options and compare prices. If there is not a workshop hosted near you, some organizations also offer online certifications. I got certified through , and all organizations will require you to also be certified in CPR. Try to find someone who has already been certified and borrow their study materials — this saved me almost $100. Look for cheap or free CPR classes. I had to pay $90 for my class, but I have since learned that there are online classes that run about $20 or so. For me to get certified through AFAA and get a CPR certification, I paid roughly $400. It’s not pocket change, but you may be able to recoup that investment quickly. If you go ahead with certification, be sure to network with the people at your workshop — the instructors and other students. I got my job through the instructor at my AFAA certification workshop. After I had my second child, I struggled to get back in to regular exercise. This job increased my enthusiasm and commitment and helped me to shed the last of my baby weight. It may not be for everyone, but you may be surprised to find that it works for you. I never saw myself doing something like this, but it turned out to be a good decision for me. I’m able to generate a little cash flow while staying in shape and encouraging others to do the same. And those toned arms don’t hurt either! I have to say, as a long time instructor I am dissapointed to see the phrase “paid to exercise”. That is certainly not the case. When I train clients, teach classes or coach small groups that is NOT my exercise time. In order to coach them well, the focus must be on them. If I am worried about getting what I need out of the session, I am going to alientate my clients and risk injuring them. On the flip side, in order to he able to teach multiple classes a day/week, it means part of my job is staying in top shape. If I am exercising at the appropriate, effective level, it would be hard to speak well, so therefore If I am truly working out my body I cannot workout and talk (essentially teaching) and the same time. Most of the time, I am walk the rooming, helping clients and adjusting equipment and don’t even get a fraction of the reps in. So, I had to set aside time outside of class to get my workouts and training in. And that is in addition to the work I have to do selecting music, preparing choreogrphy, attending certification courses and keeping up my CEUs. In addition, in order to protect my body as an insrutor, there is no way I can go “all out” when teaching 25 classes a week. Althought, I put the energy in the class there is no reason to abuse my body. Statements like “paid to exercise” really chip away at the professionalism of the Group Exercise instructor and I really hope people will stop using the phrase. I was thinking the same thing! I totally agree. Thank you for saying something. I noticed that AFAA offers their group exercise certification online. Do you know if this certification is equal to the certification obtained from the on-site class? Hi Chelsea! I have not taken the AFFA GE certification online, but our gym (I am a staff member there) has hosted it before. As I understand it, the training is virtually identical. Obviously, you do miss out on the give and take of on site questions, answers and extra demonstrations and practice during class time. In person, it is an intensive one day class. At the end, for their practicum, the attendees take turns “leading a class”, a short segment that each one choreographs themselves. Then, they take the written test. I have taken AFFA’s Personal Trainer Online Prep Course and Tele-Exercise online course, as well as the actual 3 day PT Certification Training in person. I was told at the time that if you took the PT course online instead, that there is an option to do your final practicum by webcam, if there isn’t a class or instructor near you. (However, I don’t see that training currently listed as an option, so verify that.) I would assume that the GE Cert course runs the same. I loved reading this! I’m in the midst of studying for my group fitness instructor certification and have been working through it very slowly. This has motivated me to kick it up a notch and get it finished. I’m a water exercise instructor at our local Y. The Y actually pays me to get my CPR, First Aid, and other safety certifications. My whole family enjoys the free family membership, along with discounts on summer camps and private lessons. I really love teaching, it’s a fun way to get some exercise. Make sure you are aware of costs associated with some certifications, like Les Mills. If you are a Les Mills certified instructor you will have to dish out money every 3 months to get their new music and moves and you might end up paying to teach. What a creative way to marry a bit of income with the already many many benefits of excercise. Definitely something to file away in the things to consider area of my thoughts : )! Thank you for sharing! My aunt has been a fitness instructor for decades now– through all the fads. She’s in her sixties now and has stayed so healthy. She runs “chair”-robics classes now for elderly folks in her town. My sister is almost done getting her degree & teaching cert for phys ed. She’s working at a boxing gym while she’s student teaching & can pick up extra hours as an instructor once she’s teaching, too. Again, she stays in really great shape, and she’d be a gym member anyway, so there really is savings PLUS learning a new skill set and picking up extra $$. I’ve been a group ex instructor for over 26 yrs. I started out at the local YMCA way back in 1986 & have had a free membership there ever since. I still teach 2 classes/wk there. An upgrade to include my family is only $22/mo. Just wanted to throw that other option out there. Most people think about gyms, rec centers, YMCAs, etc. when they’re thinking about group exercise. There are other opportunities out there! I was JUST talking about this today. I used to teach aerobics on the side, though I was never certified, and it was a nice bonus income but mostly it made sure I would actually go and work out! I was thinking if I could start again, I would have some external motivation to stay in shape — because otherwise I just don’t seem to care about it. You can also look at stroller fitness classes–I have known two moms who have gotten in shape with these programs, and now they teach. Their kids work out with them in parks and malls (before opening hours) and they love it. Stroller Strides and Baby Boot Camp are two that are in our area (OR). Courtney and Jen had some good points. I know Zumba instructors that are constantly shelling out more money for the latest routine CD’s and/or music! Other instructors definately bemoan the toll that teaching multiple classes has taken on their bodies, especially joints, over the years. You can spend hundreds on recerts , CEUS and conferences each year. That depends on what you are teaching though. It is a constantly changing landscape and you must stay up to date! Additionally, the human body operates according to 3 unique energy pathways. You should know the difference between them. The more you know about the science of exercise, the more you can plan your class to adequately challenge your clients and get results, without pushing them too hard. Being a good and patient communicator is an important skill too! The better you get to know your regulars, and can adapt/change or mix up the class to prevent their boredom and meet their needs, the more likely they will return, and bring friends. Keep in mind too that each class is filled with a variety of people, at various levels of fitness and knowledge. Most gyms, colleges etc. carry a high level of liability insurance to cover their instructors and their clients. If you decide to be an independent contractor, it is highly advisable that you look into coverage for yourself! You will need to be aware of how to modify exercises for class participants with prior injuries. Also, what cardio, pulmonary. metabolic or other issues you may encounter. (Hence the reason they insist on that CPR certification. AED training is recommended too!) Again, having formal instruction (certifications or degrees) is an important step to safeguard both the clients and you, as well as be sure there are only legitimately trained and well qualified people teaching. This elevates the professional level of this particular field. These days, other professionally recognized exercise training organizations (like the NASM and ACE) now require a Bachelors degree as a prerequisite for many advanced and specialized certifications.